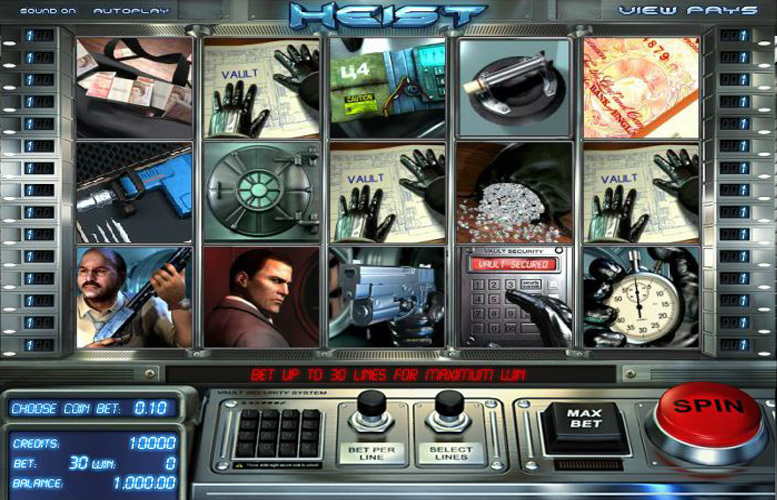 From the fantastic Ocean’s Eleven-style cinematic introduction, to the eclectic bunch of features on offer, Heist is a game with a lot of replay value. It might lack some of the stylish animation of other BetSoft titles but it more than makes up for it with its bonus rounds and side games. There are loads of different features on offer, including a game which takes place away from the reels themselves. Together, these help to make Heist an immensely playable game, which is also potentially lucrative too. Great selection of side games and bonus features. Who doesn’t love a game with so much variety? Not as strong as many BetSoft titles in the art department. 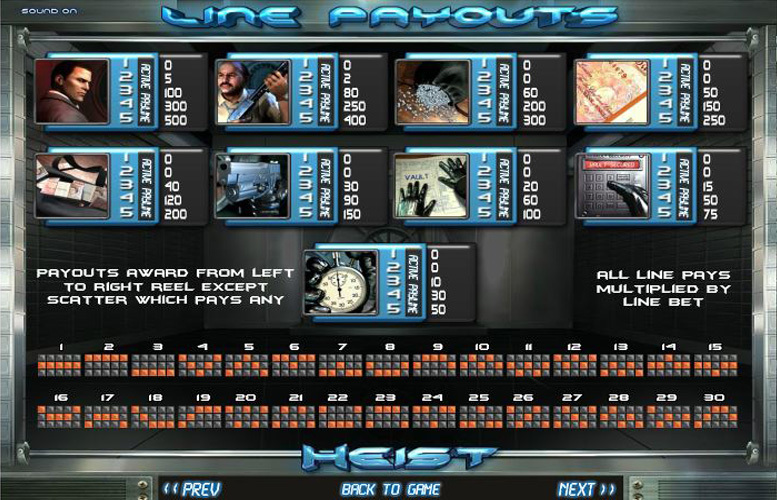 Whilst there’s nothing particularly wrong with the symbol or background design, when you’ve seen some of BetSoft’s more stylistic offerings, Heist feels a little lacking. As with many BetSoft titles, the upper betting limit is low. Whilst £75 a spin is plenty for most gamers, there will certainly be some that find it overly restrictive. Criminal = 500x the line bet. Cop = 400x the line bet. Diamonds = 300x the line bet. Cash = 250x the line bet. *Payouts listed are for one bet per line. 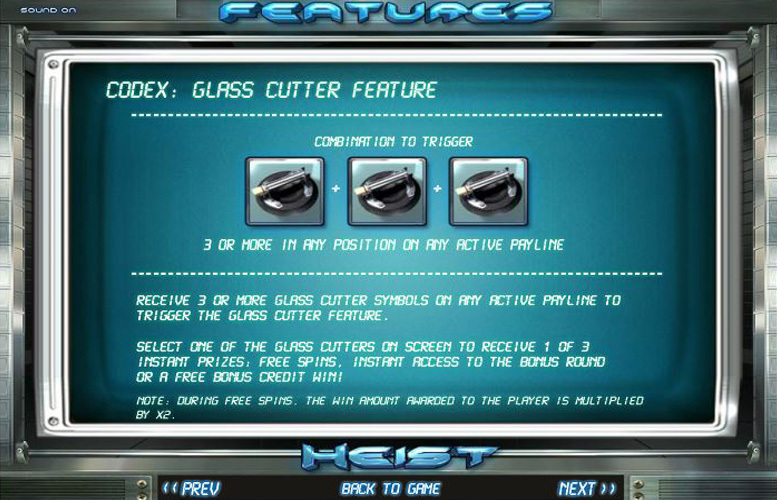 Landing three or more Glass Cutter symbols in any position on an active pay line will trigger the Glass Cutter Feature. Players must select one of the symbols to receive one of three instant prizes. The rewards available are: free spins, instant access to the bonus round, or a free bonus credit win. Players should note that during free spins, the win amount awarded to the player is doubled. Landing the C4 symbol in position two of the central reel will trigger an electrifying explosion. This will reveal a 2x “wild” reel. All pay outs involving the “wild” reel will be doubled. 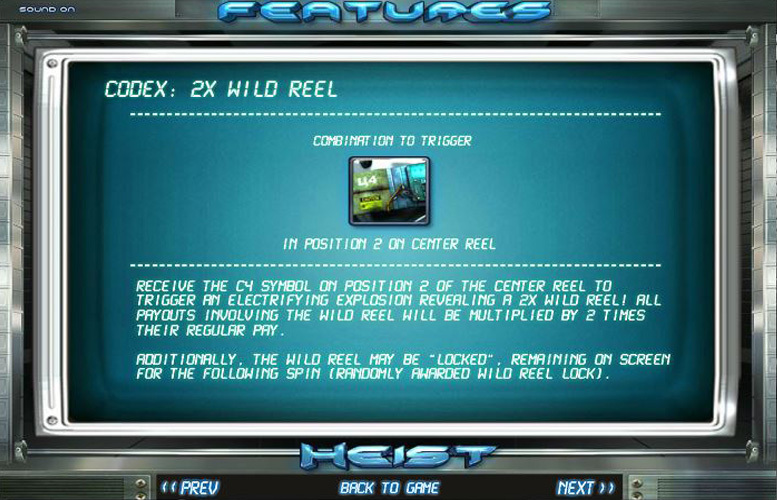 In addition, the “wild” reel may be “locked” to the screen for the following spin. This feature is randomly awarded. 3x drill symbols = 150x the line bet. 4x drill symbols = 300x the line bet. 5x drill symbols = 750x the line bet. Landing three or more vault symbols on any active pay line will trigger the second screen bonus feature. Players become the criminal making the heist and can experience the thrills of breaking into a bank for themselves with none of the risk of ending up in the slammer. They must first choose their method of entry into the vault and try to escape before detective Kowalski finds them in the act. Gun = 150x the line bet. Blue prints = 100x the line bet. Access keypad = 75x the line bet. Stop watch = 50x the line bet. 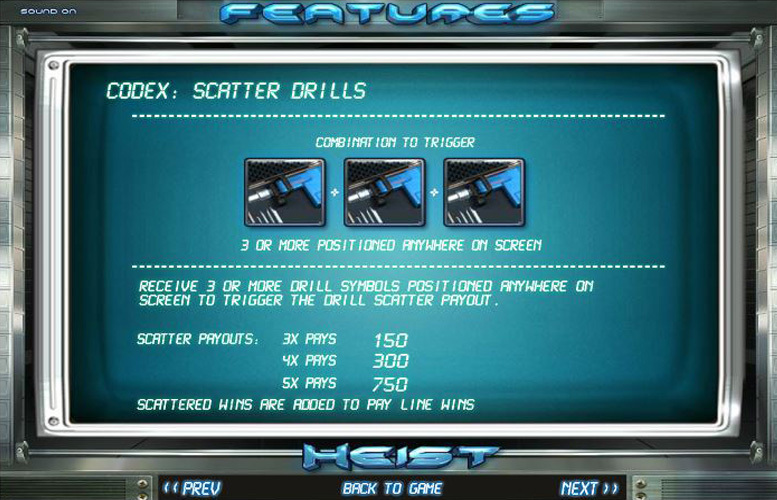 Players are given maximum discretion over how they distribute their bets on Heist. They can adjust the value of every coin between 2p and 50p, and the number of lines they bet upon. Here, the maximum value is 30, and the minimum is just one. In addition, there are options to alter the number of coins bet per line. The range for this variable is between one and five. This means that with all values set to their lowest, the smallest possible bet per spin is just 2p. Meanwhile, with all the options maxed out, the highest bet is £75. Heist is a solid title from one of the industry’s best producers. The theme of sophisticated bank robbery makes a suitable and exciting backdrop for the action. Meanwhile, the diverse selection of side games means the action is constantly varied. The title does suffer from a low upper betting limit, as well as not quite being as visually pleasing as many of BetSoft’s other titles. These minor flaws shouldn’t hinder most players’ experience, however. This game has a rating of 4 / 5 with 459 total reviews by the users.